Vintage 70's brown & white plastic Rubbermaid pitcher. Great for retro kitchen, man cave, poolside, patio, picnic or tail gaiting. Serve iced tea, orange juice, Kool-Aid, water or any chilled beverage. A funky find from the groovy seventies! It is a skinny pitcher which makes it easy to fit on a refrigerator door or squeeze in between other items on a shelf. It has a completely removable lid. Dishwasher safe, but keep away from heating element. I would put the lid on top rack of dishwasher. ❉ What you will receive: One beverage pitcher with lid. 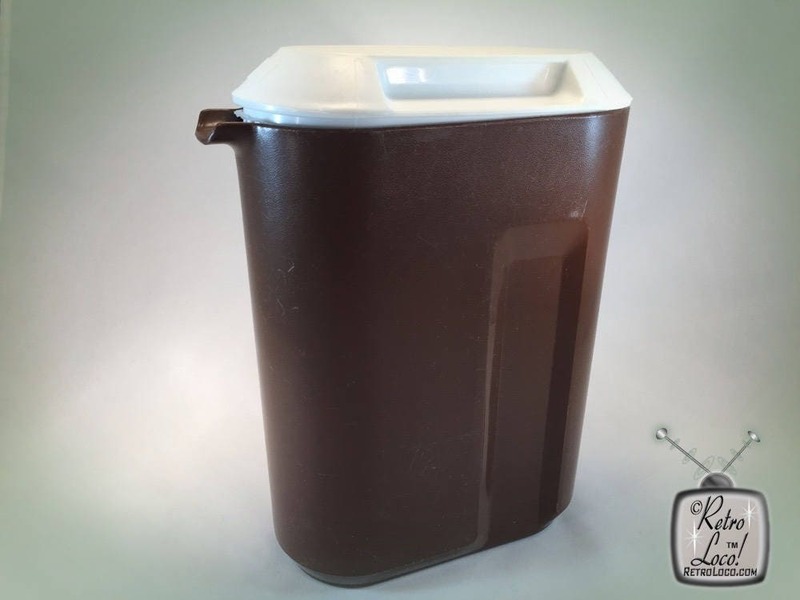 ❉ Color: Dark brown pitcher with a white lid. ❉ Condition: Good vintage condition. Normal wear on bottom of pitcher. Light scratches on outside of pitcher and lid. A few scratches and normal wear inside pitcher. Lid has slight discoloration (not as bright white on outside compared to inside). No beverage stains or odors. Still has a slight plastic aroma. No unpleasant odors. Lid fits snugly. Still very usable pitcher and lid.